Disney Infinity just got bigger. Heroes and villains. Sorcerers and superheroes. Princesses and pirates. For generations, Disney storytelling and Marvel adventures have sparked our imaginations with characters and worlds of magic, action and adventure. Now, Disney Infinity invites you and your family to enter those worlds in game experiences only Disney, Marvel - and your imagination - can bring to life. Disney Infinity (2.0 Edition) is now available on the following consoles: PS3, PS4, Xbox 360, Xbox One, and Wii U. You will also be able to download it for free on your iPad, iPhone (*coming soon), Windows 8 device and PC. In Disney Infinity: Marvel Super Heroes, you will use real-world interactive Marvel figures to activate original storylines in the virtual game worlds of some of Marvel's most popular franchises. In the Play Sets - penned by award-winning Marvel comic writer Brian Michael Bendis - players will be able to take on the role of more than 20 Marvel characters including Captain America, Iron Man, Black Widow, Thor, Hulk and Hawkeye to battle enemies, complete challenging missions, solve puzzles and ultimately save the world from destruction. 1 Disney Infinity: Marvel Super Heroes (2.0 Edition) Video Game. 3 Marvel Super Heroes Figures: Iron Man, Thor and Black Widow. 2 Toy Box Game Discs. 1 Marvel's The Avengers Play Set piece. My nephews ages 6 and 10 couldn't wait till this came in. This was the one and only item they asked for, for Christmas. They both LOVED Disney Infinity: Marvel Super Heroes. I love the graphics and the Character "skills" were amazing. They even convinced my girls to play and they really enjoyed it. Overall, if you liked Disney Infinity 1.0 and have any interest in the Marvel universe characters, I can fully recommend this starter pack. You can purchase it at stores like Walmart and Best Buy for $44.96 - $74.99. Disney Infinity: Marvel Super Heroes will make the perfect gift for any Child. ESRB Rating: Everyone 10+. DISCLAIMER: All products received are complimentary for testing purposes fromDisney Infinity. All opinions stated are my own and are not influenced by any affiliates. My boys would love that. They love all things superhero. I think my daughter would really like this. She loves super heroes. This looks really great. I think I would enjoy playing this with my son. I am sure that would have been at the top of my boys list a few years back. What a great package. They really put some thought into capturing their audience. It's so cool that you can use these in the video game. I think it would be fun to play if i could learn it! Ohhh awesome! I recently had some experience with the Guardians of the Galaxy Infinity. It's pretty cool! I love that they've included Marvel heroes. There are so many people who want to play this game now, that didn't before. This looks so much fun! Boys would love this. My kids would love this. I bet this will be a very popular gift this Christmas. What a great present for kids! Everyone loves superheroes! 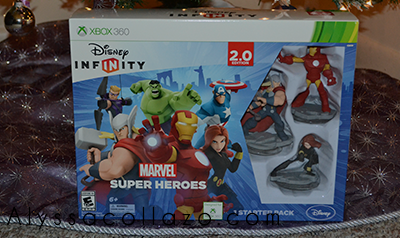 Disney Infinity would be a great gift for the holiday! I've got a 7 yr old in the house who loves superheros. I always wanted to know what this game was. My son will love it. I can just see kids loving this. I know my little one will love things like this when he's older. These are awesome!! Even the young at heart will definitely love to have these!